Okay, I don’t know if this entry is kinda cheating, since it’s three characters for the price of one. But really, these three come as a set – War is arguably the most prominent of the trio, but I can’t recall any scene with one where the other two don’t also show up – so I’m including them all as a single entry. 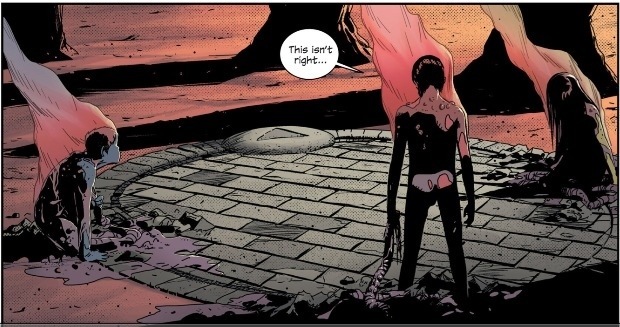 In this week’s extended showcase of the excellent new characters introduced to the world in East of West, I began yesterday with Death, and so it feels natural to now pass on the spotlight to the remainder of the Four Horsemen: War, Conquest and Famine. East of West #1 begins with them being reborn in the form of children, and we quickly learn that their return has dire implications for the world. It’s funny, after introducing us to an utterly adorable cast of kiddies in FF, Jonathan Hickman can turn around and give us the most utterly vile, horrific children seen since King Joffrey. In a world filled with moral murk and dangerous people, these little terrors – not even yet matured into their adult form and their full power – are already undoubtedly the Big Bads, casually massacring enough people to leave literal hills of corpses in their wake in issue #1, wiping out half the US Government in issue #2. Where they go, bad things happen, and their presence brings with it an involuntary sphincter-tightening of the reader bracing themselves for the worst. And their badness is hardly new, with flashbacks hinting at betrayal and maiming of our protagonists in times gone by while not yet going into the specifics: cryptic snippets of a terrible past reminiscent of Once Upon a Time in the West, with Hickman and Dragotta very much casting War, Conquest and Famine in the Henry Fonda role. I also like how, despite how despicable and intimidating the Three Horsemen are, Hickman finds a way to make them blackly funny. I’ve probably laughed at least once in just about every appearance they’ve made. Or maybe that’s just because I’m a sick puppy. Going forward, I’m keen to learn more about these villains individually. So far, we know that War is the apparent ringleader, that he relished being a woman for centuries until this recent rebirth has left him unwillingly gender-switched into a boy. We know that Famine is very visually striking, a skeletally gaunt woman with weapons that resemble a pair of whips. Conquest is the least distinct thus far, though I noted that he seems more visually striking in his briefly-glimpsed adult form from the flashbacks. But I see that there’s a spotlight issue on the Horsemen coming up, so hopefully that will give us a fuller portrait. From Monday-Friday this week the 30 Character Showcase will take an extended look at some of the many excellent new characters introduced in East of West, the epic new Image sci-fi/Western mashup from writer Jonathan Hickman and artist Nick Dragotta. It is arguably the best comic series to launch this year, and has quickly established itself as one of the very best titles on shelves today. In my opinion, a big part of that is down to the characters, with Hickman and Dragotta populating their alternate-history America with a wealth of wonderfully-realised characters, with engaging personalities and distinctive designs. And at the centre of it all, perhaps the most engaging and distinctive of all the figures within the ever-growing East of West ensemble: Death. 6 issues in, and there’s still a great deal we don’t know about how this incarnation of the Four Horsemen fits into the world around them, how exactly Death came to be divided from his brethren, and why they portrayed him. Or why he seems to have changed colour from black-skinned to a solid white – a veritable “pale rider” – since that betrayal. 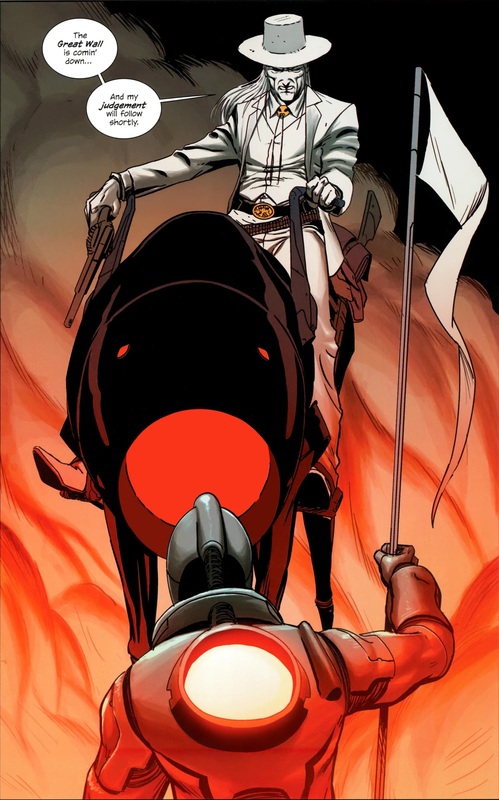 But though a lot of mystery surrounds death, he is nonetheless a commanding presence cutting a bloody path through the world of East of West in his quest for vengeance on those who wronged him. Right from his first appearance, he makes his impression, entering the saloon with an instantly-iconic first line of “And so I have arrived,” and from there quickly introducing his now-familiar Highly Intimidating Monologue. Hickman gives Death a way with words that utterly hammers home his gravitas and the idea that he’s the scariest man in any room he walks into. And while his followers Crow and Wolf aren’t featured individually in this 30 Character Showcase, they work incredibly well as an extension of Death’s presence on their page, their sparse, iconic designs suitably complimenting Death’s. In the issue where he first appears, Death murders the President of the United States, which is a hell of a way to make a first impression. But from there, he just keeps revealing more and more and becoming all the more compelling. Take, for example, his means of transportation, as seen above. In its first appearance, it appears to be a futuristic space-pod, something which presumably runs like a high-tech floating motorcycle. But once he sits on it, it grows legs and turns into a kind of robo-horse. That alone would make it incredibly badass. But then in issue #4 it is also revealed that it has a massive cannon capable of wiping out whole batallions of opponents with each blast. Issue #4 in general is a simply epic showcase for Death’s power and badass credentials. But in issue #5 we get a glimpse of a different, more vulnerable side to our stone-cold protagonist, as his tragic love story with Xiaolian is further explored. It’s an added dimension that gives him more nuance than just being an implacable force of nature. There’s so much more to discover about Death and his shady history. Chief on the list is how someone so seemingly unstoppable was laid so low. 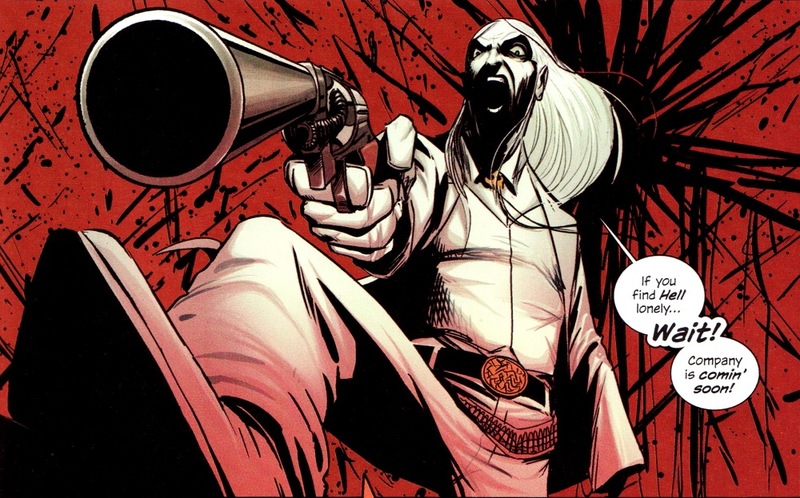 And you can be damn sure I’ll be avidly reading each upcoming issue of East of West to find out more, and to see just what he’s going to do next! What, another review so soon!? As it happens, Image had more than one issue #1 hit comic shops this past week. For me, at least, Velvet came along with heavier anticipation on my part. 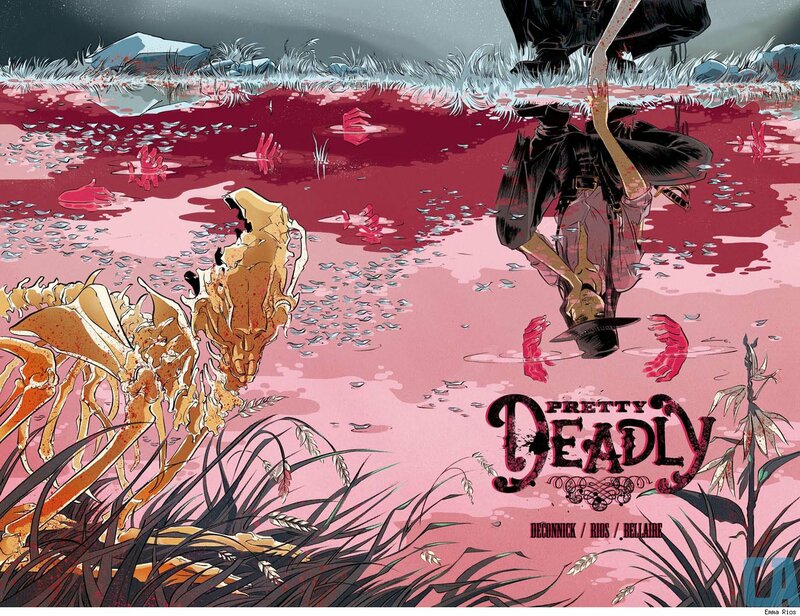 While I’d heard about that from Image Expo and have been looking forward to it ever since, Pretty Deadly first came onto my radar when Image began running that teaser ad in the back of their comics. I knew nothing about the plot, other than the presumed Western setting, but that striking image of Deathface Ginny, along with my familiarity with the creative team – I really enjoyed the Osborn miniseries a couple of years back, so I was already of the opinion that Kelly Sue DeConnick was at her best when paired with Emma Rios – ensured I would at the very least give the series a try. But this past week, it seems like Pretty Deadly has had a surge in press and attention, partly fuelled by a retailer-related controversy, that has arguably turned it into a more high-profile debut than Velvet, and so going in I quickly learned more about the premise. To be honest, I was a little wary, with the “embodiment of Death stalking through a Western setting” putting me instantly in mind of East of West, another new Image series from this year which has tread that territory with great success. Thankfully, once I actually read the comic, I realised that – ostensive parallels aside – this is a very different book from Jonathan Hickman and Nick Dragotta’s genre-splicing opus. If anything, Pretty Deadly shares more DNA in common with The Sandman. In the lyrical, seeming allegorical opening sequence, Kelly Sue DeConnick seems to be channelling Neil Gaiman’s fascination with the power of narrative, and how the act of storytelling can become transformative for the storyteller; a motif that recurs in various key beats through the first chapter. By the time I’d finished with Pretty Deadly #1, I found myself intrigued, and certainly keen to check out issue #2. But I didn’t love it, and I didn’t find it as immediately engaging and likeable a read as Velvet #1, which I’d read just previously. In comparison, I found Pretty Deadly lacking in urgency, and a bit unclear and confusing in certain places: I wasn’t always sure how one scene connected to another, or what significance certain characters and moments were to one another. But after dwelling on each comic for a while, it was Pretty Deadly that I returned to for a reread first, later that night. For whatever reason, there was just something about this comic that simmered away in my mind, and I just had to keep digging into it, trying to unlock it. At the time of writing this, I’ve now read Pretty Deadly #1 four times, and each time I pick up some new detail, and it becomes a richer reading experience that I appreciate more and more. And I even understand most of what’s going on, now. The only bit I still struggle with is how the group of bandits go from shooting at Sissy and Fox to getting shot by them, to suddenly being their compatriots and travelling with them. I think it has something to do with them actually shooting at the lizards rather than our two protagonists, but it’s still not entirely clear. But to come back from that tangent, the point I want to make is that Pretty Deadly is a layered comic that rewards multiple readings. Much of the depth comes from the magnificent artwork of Emma Rios. There’s so much stuff in here that I just glossed over in my first reading, but when you really focus on the visual construction of this comic, it’s just a weird book. The rhythm of the comic is so unorthodox, packed with additional panels that draw out moments in ways that don’t often happen in a comic book. In one memorable sequence, a single 4-word sentence is drawn out over 4 panels, all focusing on the movements of two interacting hands. And the whole issue is filled with strange beats like this. 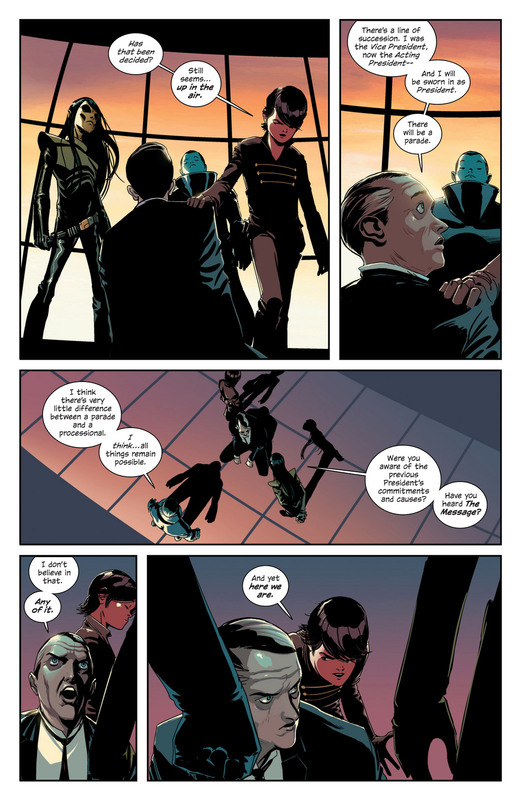 It’s not uncommon to find 10-panel pages here, pages densely packed with little window-panels adding additional colour to a scene, be it a close-up of a character’s reaction to what’s going on or a seemingly tangential riff that takes on symbolic power. If Scott McCloud were ever to release a new edition of Understanding Comics, Emma Rios’ work here could make for an excellent case study on the ways art can shape the pacing of a comic. One sequence that is already being celebrated for its innovation is our introduction to our two most prominent characters in this first issue: Sissy, a mysterious little girl in a vulture cloak, and Fox, a blind man with possibly-supernatural powers who protects her. In the sequence, Sissy sings the story of Deathface Ginny, as Fox points to various key images from her narrative on a large painted canvas. They are acting out “cantares de cego”, viewed by many as an ancestor to what would become the comics medium in how it married words and images to tell a narrative. And in her intricate two-page tableau, Emma Rios gives us with a delightfully metatextual flourish an exploration of how we read comics. In illustrating what the gathered crowds are doing as they watch Sissy and Fox’s performance, in the form of ghostly images filling in the gaps between the various pictures Fox is pointing to, Rios is demonstrating how we as comic readers fill in the gaps between the still images on the comic page to create a moving narrative in our mind, so seamlessly we often don’t even realise we’re doing it. I recently watched Room 237, a documentary on the hidden meanings found within Stanley Kubrick’s film adaptation of The Shining, and in that one of the commentators talked about how the film works on a subliminal level, because just about every scene has an impossibility, something not quite right that you don’t even consciously register, but which nevertheless sets you ill at ease. And I was put in mind of that with the work of Emma Rios here, which just has this unusual, off-kilter quality that becomes oddly hypnotic, right down to the strikingly offbeat cover. As a reader, our eyes are so drawn to Deathface Ginny lingering just out of sight above the uppermost boundary of the cover that we might not immediately notice that there are blood-red hands rising out of the depths of the water her face is reflected in. Assisting in bringing Emma Rios’ visuals to life is ubiqitous colourist Jordie Bellaire, who brings out a different quality to Rios’ art. When I’ve seen her artwork elsewhere, it has been coloured very softly, giving it a gracious, flowing feeling. But Bellaire’s coloring here is much more stark and barren, befitting of the Western aesthetic, which gives Rios’ visuals a harder edge, a rough-hewn quality that once again put me in mind of some of the earlier artists on The Sandman. As for Kelly Sue DeConnick’s writing, as mentioned, it is oblique and allegorical, the writer going in directions I’ve never seen her take before. It doesn’t do what you might expect from the narrative: Deathface Ginny, for example, has a very small role in the narrative, only really showcased through Sissy’s song here. And it almost feels like it’s only in the last page where things really get going. But the script is packed with little incidental details and subtle character beats that capture the interest and bring these characters to life in quiet, unexpected ways. Even figures with smaller roles leave lasting impressions here. A favourite moment of mine was the conversation between Sissy and the little boy in the house they’re sheltering in. I loved the dynamic of them both appearing to be around the same age, but Sissy being much more worldly and beleagured than her wide-eyed companion. To return to the puzzle analogy, it feels like we’re seeing a few pieces of something larger being laid out by DeConnick here, and in a few issues we’re really going to see how it all connects together. Almost as enjoyable as Kelly Sue DeConnick’s writing in the main comic was her afterword, going through her journey to getting Pretty Deadly made. And it’s quite a revealing piece of writing, almost framing the narrative of her life as a big journey that has all been leading to this comic seeing print. No pressure or anything! I didn’t quite warm to the little prose story in the back, though my realisation that the Johnny of that story was the Johnny of the main comic narrative – someone who I assumed would be an incidental figure we’d never see again – suggested to me this might have more relevance than it currently appears to possess. So, as it turns out, Pretty Deadly #1 has quite a lot to digest. In truth, I feel like I’ve barely scratched the surface in this review, you really ought to just go read the thing and make up your own mind. This is a thorny, difficult book, and it’s not for everyone, but I think if you engage with it, you’ll find a whole lot to admire, including career-best work from both Kelly Sue DeConnick and Emma Rios. Pretty Deadly #1 is out in all good comic shops now.